This is the third blog post in a series authored by 12 individuals who received scholarships to attend the 2018 Science Boot Camp held at Brandeis University on June 13-15, 2018. Please watch for more posts about this event and from scholarship recipients in the upcoming weeks. Also read the first and second blog posts. 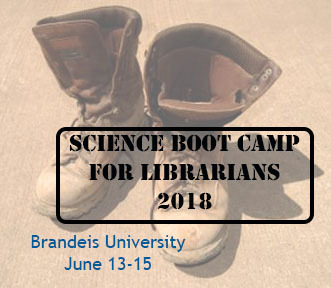 Attending Science Boot Camp 2018 was the best professional development I’ve had so far as a new academic librarian. Supporting the science side of my new role is my biggest challenge, and learning more about the topics at Boot Camp has started to fill in my knowledge gaps. Boot Camp was a short and sweet experience; 2 ½ days really flew by. Despite this being my first boot camp, I felt immediately welcome by members of the Planning Committee and fellow attendees. I arrived early enough Wednesday morning to wander around the lovely Brandeis campus (bunnies everywhere! ), and attended the pre-camp visit to the Robert D. Farber University Archives & Special Collections. The archivist was thrilled to show off the science and medical special collections; weird and wonderful pieces included a book on the science of toenails! This year’s topics covered ecology, genetic counseling, and materials science, and I learned so much! Miranda Davis of UConn gave an easy to understand overview on ecology, and Brandeis’ own Eric Olson’s presentation on his Lyme disease and tick research was especially fascinating. We learned about tick lifecycles and how they contract Lyme, how deer end up as walking singles bars for adult ticks, and how possums may be our saviors to help lower the spread of Lyme. The show and tell Materials Science presentation delivered by Chris Schuh from MIT was such a great experience. As the “architects of solid matter” he showed us how materials scientists bring ideas from other science disciplines and engineering to create really useful things – including 3D metal printing, foam made out of aluminum, neural interface fiber probes, and super elastic wires. Being a scholarship recipient was very beneficial. Having the registration covered was helpful, and being assigned a mentor was even better. I really appreciated the dedicated time in the schedule for meeting with mentors – I wish it was longer! Talking with my mentor, Barbara Merolli, was invaluable. We had similar work experiences, and after peppering her with questions I felt like I was on the right track settling into my new role. Having buttons identifying mentors and mentees was a great idea, and helped the mentees in particular mingle with each other. Maybe sensing kinship, many of the librarians I spent time with at camp were fellow mentees. This was also only my second experience live tweeting and following an event hashtag (#sciboot18) on Twitter. It was great engaging with fellow campers on Twitter, and sharing what was being presented for everyone who couldn’t attend. It was also amusing to be recognized at breaks from my Twitter profile and it helped break the ice meeting people. Boot Camp was educational yes, but also a lot of fun! Meals were great, staying in the dorm was an experience in and of itself, and the banquet was a blast. I can’t say enough positive things about the Planning Committee, and how well everything was organized; their hard work showed. And the food! I’m someone who has to snack often or I get hangry, and I never went hungry with all the delicious snacks and meals at Boot Camp! I loved my time at Boot Camp, and will definitely attend in the future. 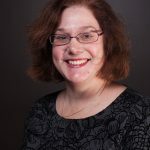 If you’re looking for an opportunity to connect with your community of science librarians, learn about interesting science topics from interesting people, then I highly recommend New England Science Boot Camp! Thank you again for the scholarship and the opportunity to attend.